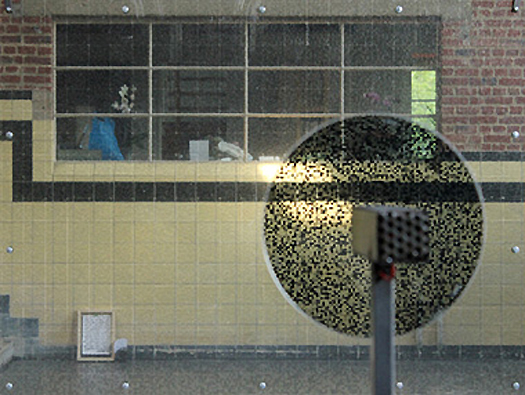 "Static/Continuization Loop are two works by Wim Janssen about the phenomenon of television static. The same recognizable and commonly known image of television static is being generated through two completely different techniques. Not the image itself, but the way it is reconstructed and materialised, is the most important part of the Statics-series. "Lightwaves, besides their frequency and amplitude, also have an orientation. Polarization filter only lets light pass in one such orientation. When you look through a piece of this filter, it's perfectly transparent, just a bit darker than normal plexi or glass. When you look through the filter at an other piece of this same material, rotated 90°, the second piece becomes an opaque black surface because the light passed through the first filter can't pass through the second filter. Every other orientation gives a different degree of opacity. 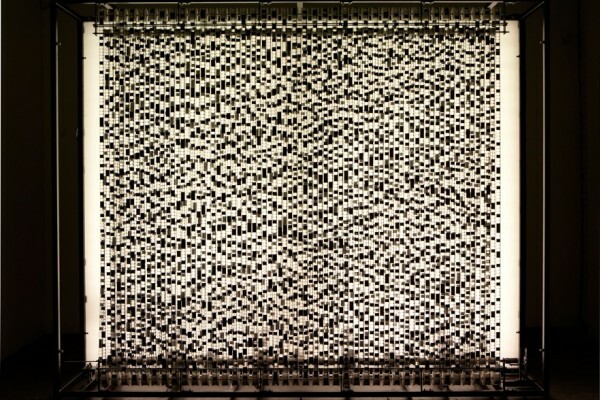 For Static, this material was cut into small rectangles of one cm2, in random orientations – like large pixels. 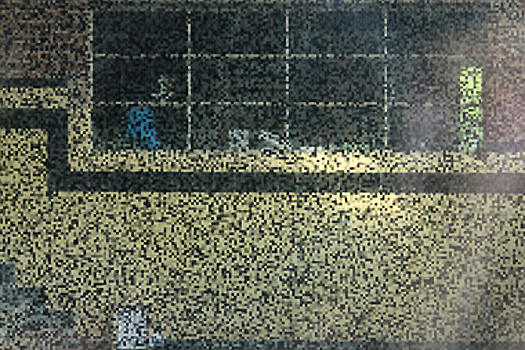 These little squares are put between two large rectangular pieces of plexiglass (189 x 2412 cm). The screen looks like a slightly darkened window. In the exhibition space a slowly rotating disc of the same material is also placed. When the screen is seen through this disc, it changes into a half transparent field of video noise. White noise created, purely by the manipulation of light." 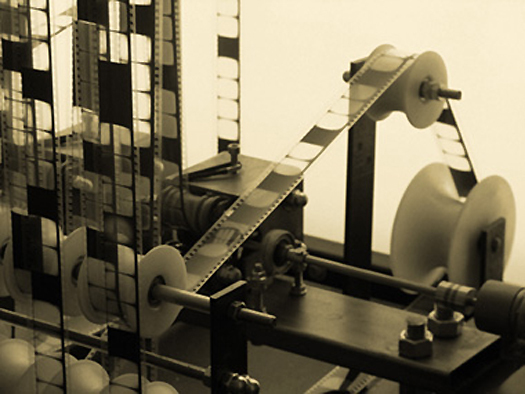 "In Continuization Loop, a single 35mm film loop is pulled up and down over more than 150 guiding wheels, creating a wall of film. The frames of this piece of film are only black or transparent. When the loop travels through the mechanism, the image of video static appears. 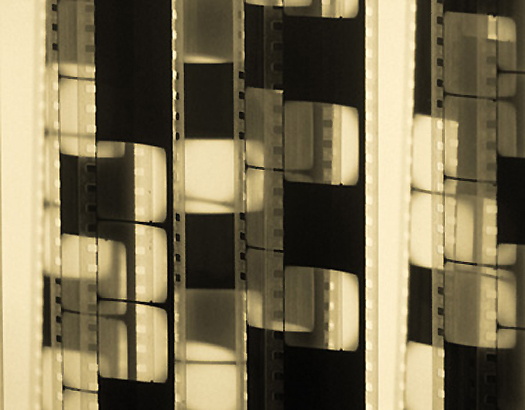 While film as a medium normally makes images appear through projection in combination with the transport of celluloid through a projector, Continuization Loop omits the projection and makes the image appear by means of the transport only. The installation combines and imitates visual elements from three generations of visual media: the material aspect of film, the empty signal of video and the binary logic of digital. But at the same time the most important attributes of these media are absent: there is no construction of an illusory filmspace, there is no real video image and there are no computers involved."